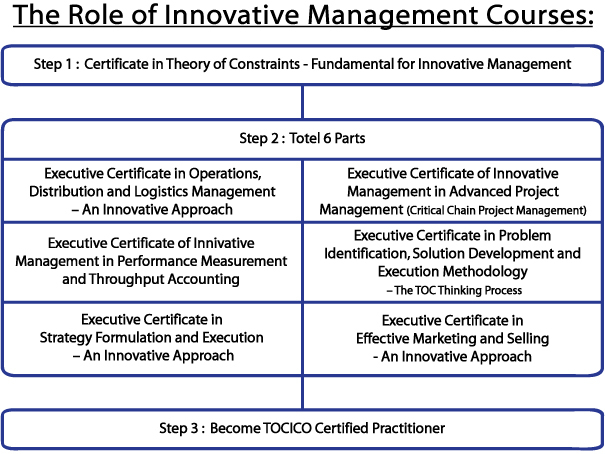 Certificate in Theory of Constraints – Fundamental for Innovative Management which is for Theory of Constraints International Certification Organization(TOCICO) Fundamentals Certificate. Executive Certificate in Operations, Distribution and Logistics Management – An Innovative Approach which is for TOCICO Supply Chain and Logistics Management Practitioner Certification. Executive Certificate of innovative Management in Advanced Project Management(Critical Chain Project Management) which is for TOCICO Critical Chain Project Management Practitioner Certification. Executive Certificate of Innovative Management in Performance Measurement and Throughput Accounting which is for TOCICO Throughput Accounting Practitioner Certification. Executive Certificate in Problem Identification, Solution Development and Execution Methodology – The TOC Thinking Process which is for TOCICO TOC Thinking Process Practitioner Certification. Executive Certificate in Strategy Formulation and Execution – An Innovative Approach which is for TOCICO Strategy and Tactics Practitioner Certification. Those candidates that have passed the TOCICO Fundamentals Certificate and TOCICO Certified Application Exam, who can register to become TOCICO Certified Practitioner.